The reason why he needs it to be web based is because he’s always on the run servicing clients. 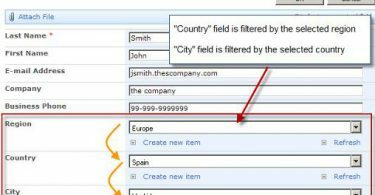 Being able to generate and manage his invoices online is a good way to keep all his invoices at a central location. No longer does he need to worry about backing up his pc in case of a hard disk crash, theft, etc. I did some internet research and found out that there is indeed a web based invoicing software he could use and it’s called BambooINVOICE – a free open source invoicing software intended for small businesses and independent contractors. 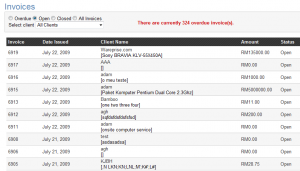 BambooINVOICE is a web application that is released as an open source software (GPL). 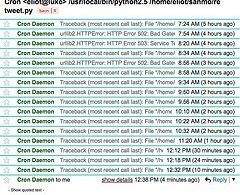 In order to use it, the application has to be set up in a web environment (Apache, PHP, MySQL). Before setting up the application, I gave BambooINVOICE a try myself and found it quite good and comprehensive enough to get the job done. I started off by logging into the demo system. From here I could manage invoices, clients, reports, tweak settings, accounts and utilities. I headed on straight to create an invoice just to see how it looks. I had the option to either select an existing client or create a new client. In my case, I created a client called Wareprise.com. 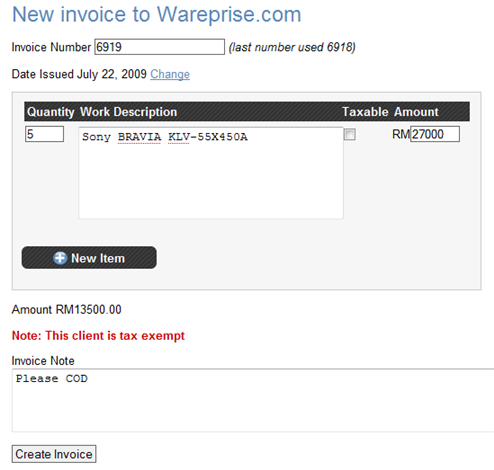 Clicking on the Create Invoice button shows the screen below. After entering all the required details such as the item description, quantity and price, a final amount is automatically calculated for me. Also not that I could add new line items simply by clicking on the new item button. 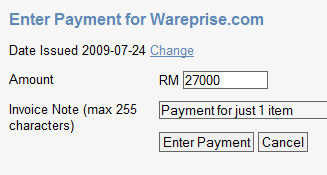 Once done, clicked on the create invoice button to save and actually create the invoice. Let’s say someone makes a payment, all you need to do is to click on the Invoice number to update the payment amount for the invoice. Note that the payment is made for just one item so the status is still kept as open. At the bottom of the screen is a payment history for you to keep track of all payments made. 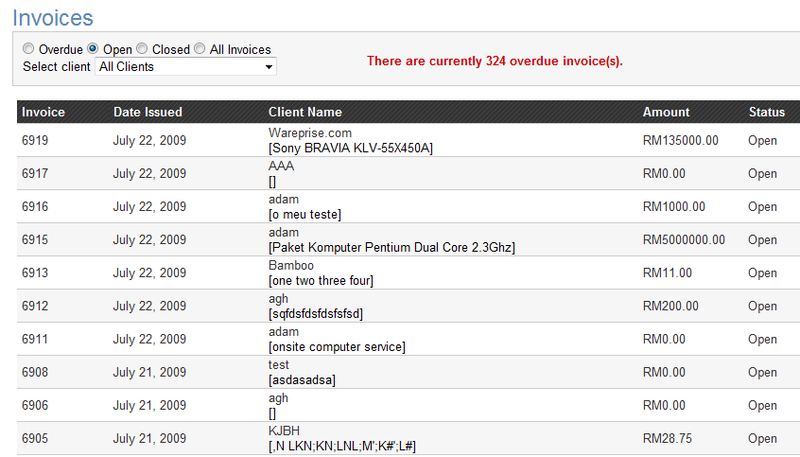 Once all payment has been received and recorded, the status of the invoice will be automatically converted to closed. It’s recently been re-launched (completely re-written front to back) so its easier to use, quick, simple, reliable and secure. Feature wise its got recurring invoices, HTML formatted invoices, PDF invoices, multiple currency support, Paypal integration, late payment reminders and thank you messages, plus more! Featured as an “Editor’s Pick” on Apple.com’s iPhone homepage its very well regarded as an online invoicing tool, as well as iPhone compatible making it very useful for people who want to access their invoices whilst out of the office. If you like the sound of this, check it out and sign up for a FREE account. @ria Simpson: Är Billingboss reklamfinasierad? eller finns det tillägg som kostar? Eller tar ni någon transaktionsavgift för inbetalningar? @ria Simpson: Is Billingboss Ad financed? or are there addons that cost money? or do you take a transaction fee for online payments? You must make money somehow. Strange, this page is available in both English and Swedish… This might confuse the user that you can reply in a different language…. Is it translated thru a google translate addon or something? 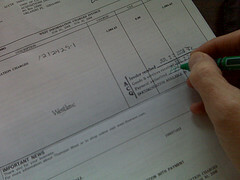 I have been using BillingBoss for more than 6 months to send invoices to my clients. So far I didn’t have to pay for any of the services. When my clients pay me via Paypal, BilingBoss doesn’t take a cut. I guess giving free services is a way for Sage to promote their brand. And yes, this site is translated by Google Translation engine. Thanks for dropping by and leaving comments.